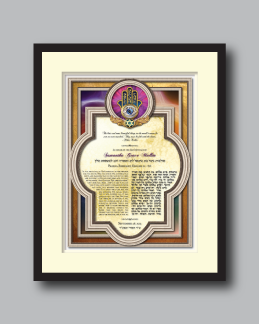 Personalized Bar or Bat Mitzvah Art :: "Chamsa"
The "Chamsa" depicted in the central upper window of this design gives this B'nai Mitzvah design its name. Overlaying a field of gold and separated by a silver border is an electric ether with a multitude of colors spanning the spectrum. This symbolizes the very spark and source of life given to us by Gd. At the top of the design, within the circular silver window, a chamsa or "hand of protection" stands proudly amid a field of color undulating with power. Within the chamsa itself are the Hebrew words for "joy", "good luck" and "wisdom". These are wishes bestowed on the Bar or Bat Mitzvah boy or girl. 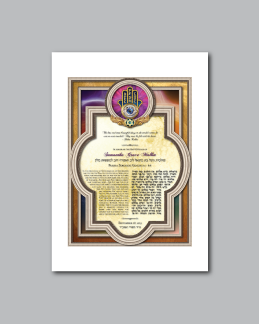 Within the text area of the design, above the name of the B'nai Mitzvah, is the following inspirational quote by Helen Keller, "The best and most beautiful things in the world cannot be seen or even touched. They must be felt with the heart". 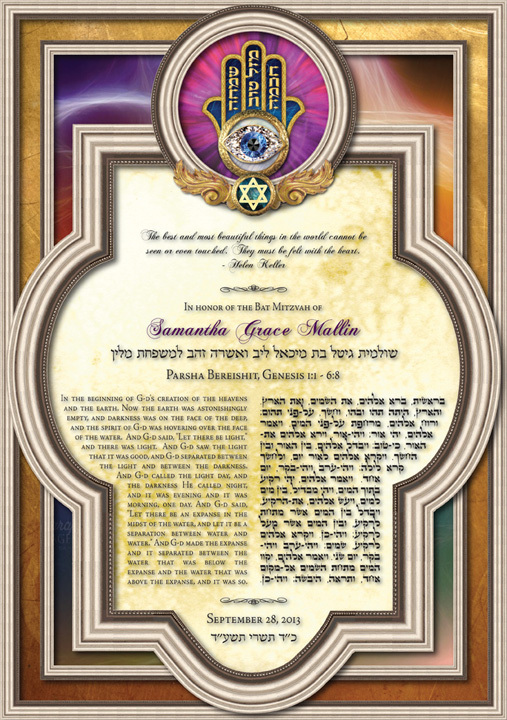 These words, along with the imagery of the chamsa, are meant to inspire the Bar or Bat Mitzvah boy or girl to remember their spiritual connection with Gd and carry the wishes of happiness, joy, luck and wisdom throughout their lives.